Digital OR Paper Notebook? That’s Not the Question. I have a confession to make. I have not been keeping up with my writer’s notebook. This isn't really the best place to make this confession since, if you are here, you likely use a writer’s notebook regularly. 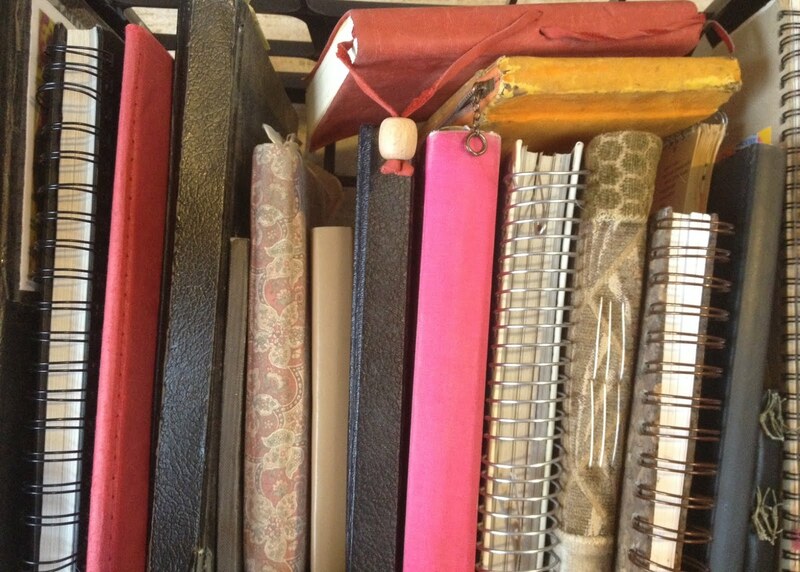 I admire people who have a notebook habit. 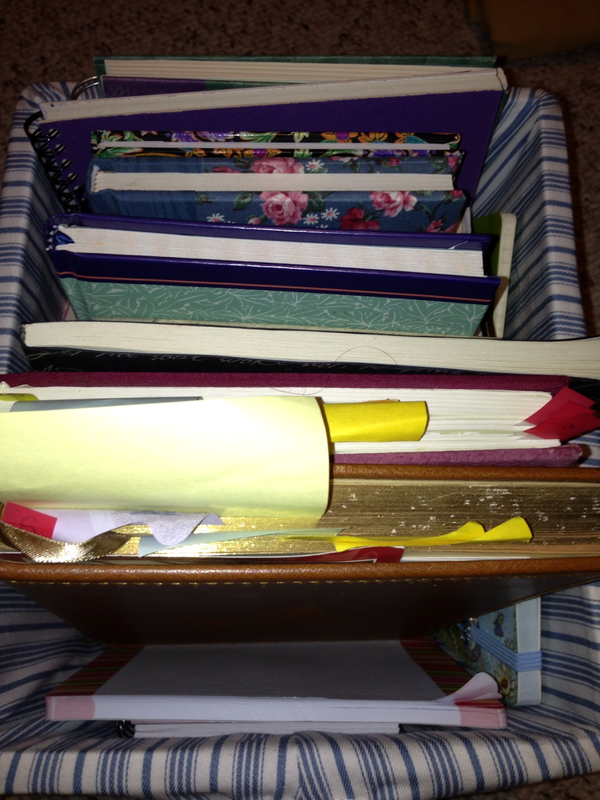 Those who have kept notebooks since as long as they can remember. Those who have their notebook with them at all times ready for inspiration. Writers who have made it a routine to get something in their notebook each day. 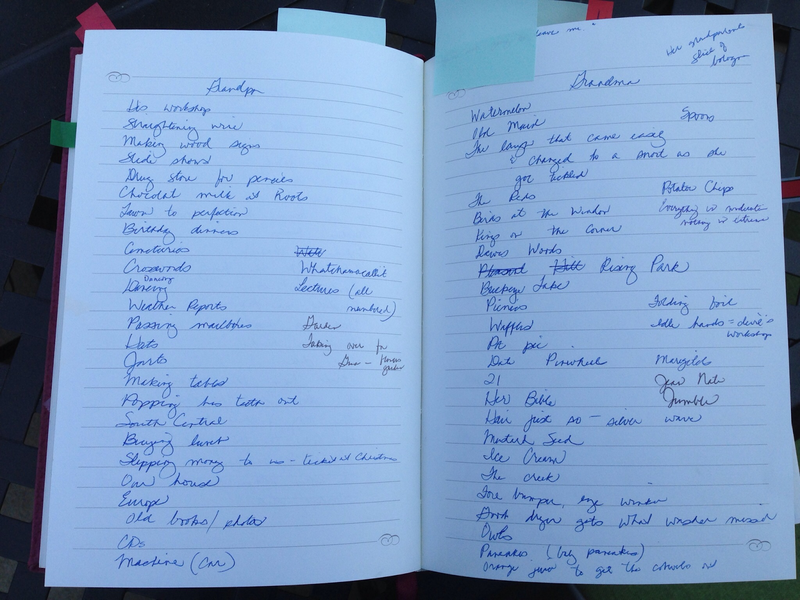 I’m always fascinated by the things people collect in their notebooks and the habits they have for writing in them. Sadly, my notebook habit has been slipping away for some time now. I suppose it happens to everyone now and then, but for me it has been going on for far too long. 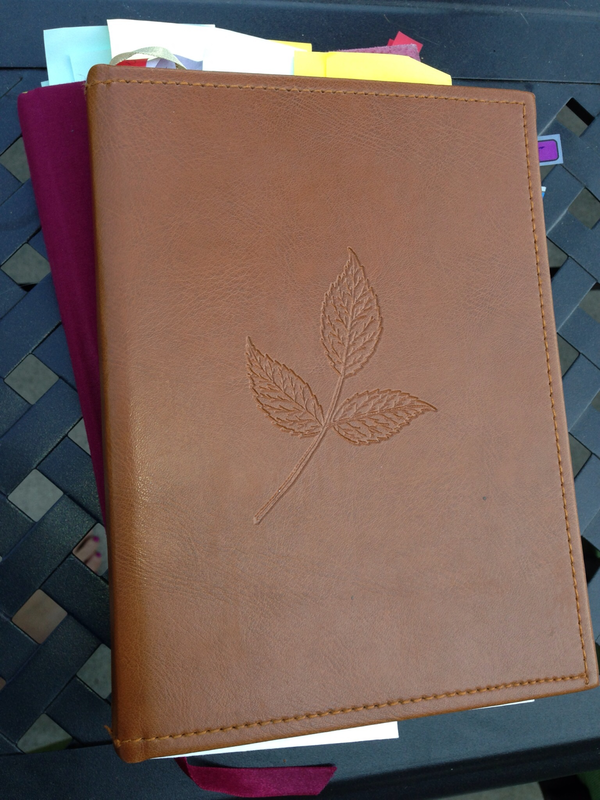 My writer’s notebook has been a place where I record memories, play with poetry, capture favorite lines from books, tell stories about my children, collect snippets of language, and pause from the busyness of life just long enough to write about this or that. In the last few years, I've found my notebook habit unraveling as more and more often I find myself with a device in my hand instead of pen and paper. There's something about putting pen to paper. Being caught between a paper and digital print world has its challenges. For me, the more I found myself with a device in my hand the less I was writing in my notebook. The truth is, I've missed my notebook habit. I miss having ideas ready when it’s time to write. I miss having a place to play with words until they sound just the way I want them to sound. I don’t want to think about how many ideas, stories, or poems have slipped away since my struggle began. In the last few months I've been trying to solve this notebook dilemma by playing with a variety of notebook possibilities. 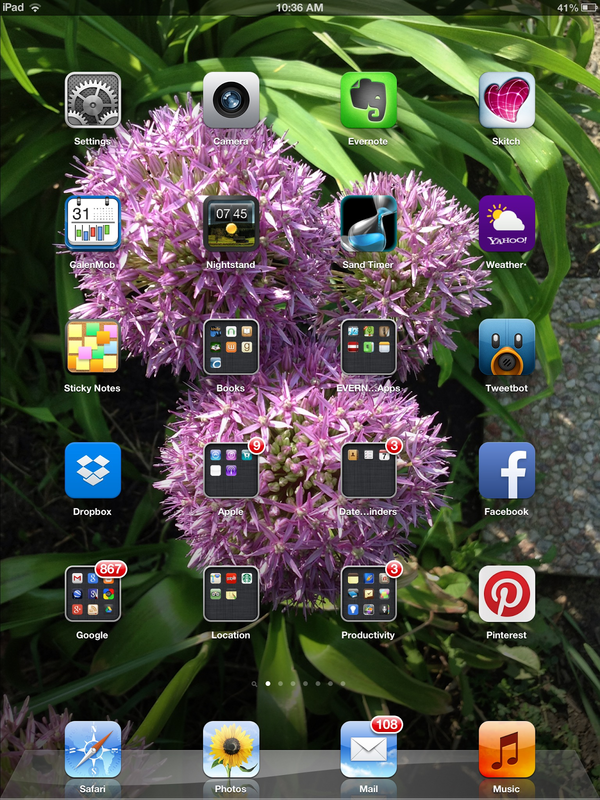 I've been playing with notebook apps for my iPhone and iPad. I've considered different software on my laptop and have dabbled in web based tools like Google Drive. I've even had my paper notebook and pen out along the way. It’s been messy. Where do I get ideas for my notebook? What has got in the way of getting ideas down in my notebook? When do I want to write ideas in a notebook, but I don’t find it with me? What types of things do I want to collect? What tools do I want to have to record writing? I've created a spreadsheet with some of the applications I worked with during this time of exploration. This is a shared document that I’m hoping will grow as others visit and share their knowledge about applications. You are welcome to stop to add applications or improve information. 1. My paper notebook: I’m still a little worried I will not always be able to get to digital applications. Software changes and hardware updates sometimes make tools obsolete. For this reason, I’m still using my paper notebook to create stories I want to hold onto for years to come. These are the stories of our family, important events, and writing that I would want to be able to keep. I also sometimes return to my notebook to write poetry or play with words. Sometimes actually writing the words by hand helps me to compose, remember, and clarify thinking. I usually go to my notebook when I have at least 20 minutes to work on an idea. notebook - about pen in hand. 2. 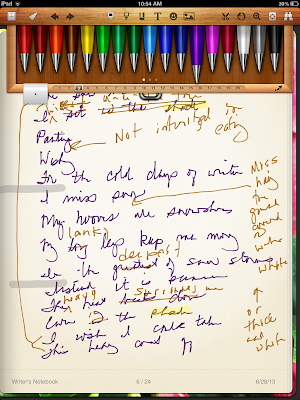 Noteshelf: I’ve decided my go-to writer’s notebook app will be Noteshelf. Noteshelf lets me create different notebooks and put them on a shelf to view. This application lives on my iPad and allows me to insert pictures (which I love! ), type with a variety of fonts, and write by hand with two types of pens (and so many colors/sizes!). Pages are automatically dated when you turn them. 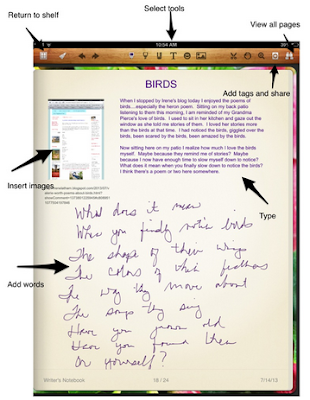 Noteshelf allows tagging which makes it easier to return to ideas. It also has sharing features (email, Twitter, Facebook). A few improvements I’d like to see are the ability to view in a double page spread format, an easier share with Evernote (right now I have to send as a PDF), and it would be nice if I could access this from my iPhone too. Here’s a poem in draft form on Noteshelf. The final poem was Winter Wish. You have to love those pen choices! I don’t often sketch in my notebook. I wish I would do it more often. after reading a blog post at Irene Latham’s blog. 3. Super Note: I also needed a place to keep lists of writing ideas. During the day I sometimes read something, have a conversations with someone, or see something that gives me an idea of writing. I’ve been using Super Note to make lists for the types of writing I do most often: poetry, Reflect and Refine (educational), Merely Day by Day (Poetry Friday and Slice of Life), Choice Literacy, and general notebook ideas. I use this when I am on the go and do not have time to get the bones of the piece down in a draft. is a list of ideas and quick writes. It seems we all have to find our place in the print world and the answers are likely different for each of us. This is where I am today with my writing. I needed to start to make some decisions so I could get back into the habit of collecting ideas and thinking. My hope is you will find this in some way helpful. Everyone needs to find the system that works for them whether it is a beautifully bound notebook, scraps of napkins from local restaurants, post-its scattered about, or digital tools. Hoping you find your space. 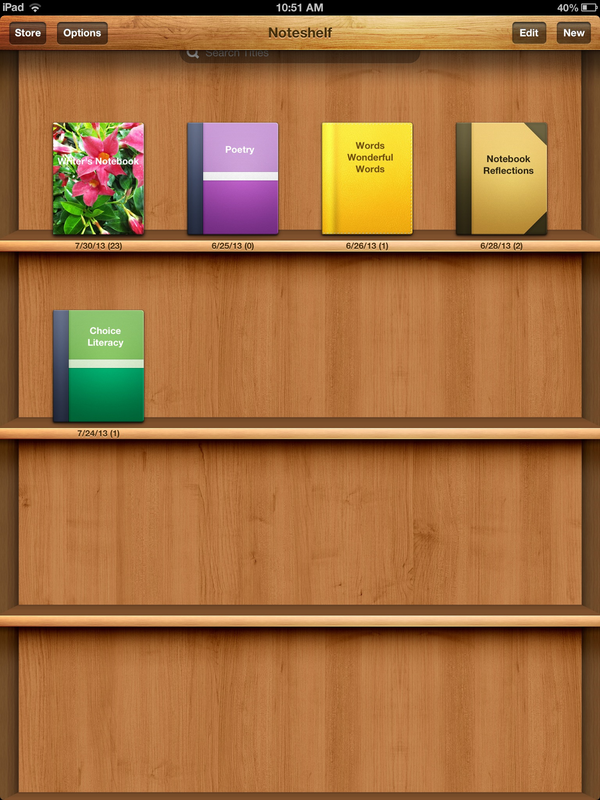 Choose three different applications to download or use. All writers have a special place they like to work. For me, I enjoy writing on my patio. There’s something about being outside that makes me want to put pen to paper (or fingers to keyboard). Think of the space you like to use for writing. What do you like about it? What does it look like? What does it sound like? What do you like to have beside you as you write? Write about this place in your notebook and try it in your digital applications. You may want to try to write about different aspects of the space to keep the writing interesting and dig deeper into your love of the space. What different ways can you compose using different tools? Which feels the most comfortable? You might try this with other types of writing you do frequently to begin to find the tools which work best for you. Maybe it’s an AND not an OR for you too. 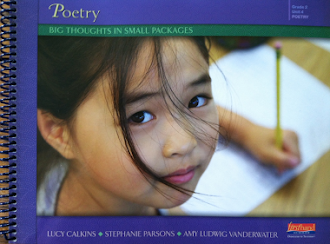 Cathy Mere spends her days learning alongside first graders in Hilliard, Ohio. In her spare time she can be found resting on her patio with a book or trying to find her way in a world of words. 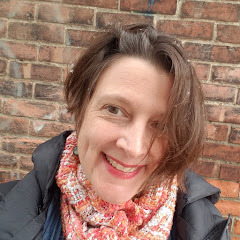 She spins tales and dabbles in poetry at Merely Day by Day and joins the professional conversation about literacy, technology and education at Reflect and Refine: Building a Learning Community. In the comments please share your favorite tools for collecting your ideas. What works for you? What changes do you feel you might need to consider? Cathy will be giving away a free writer’s notebook app pack which includes a version of Noteshelf for the iPad, Super Note for the iPhone or iPad, and a copy of a newer notebook that looks promising: Day One (Journal/Diary) to one lucky commenter whose name will be drawn on Sunday, September 1. I need to buy a stylus since I find I don't carry my notebook with me much anymore. I use my phone to snap pics of things I want to return to write about on my blog, but I don't use a writer's notebook the same way I used to before getting an iPhone and an iPad. 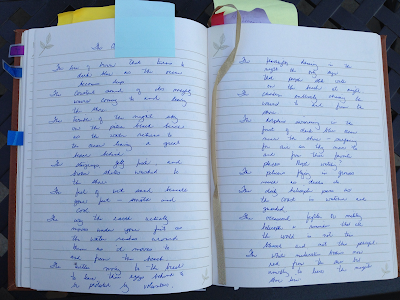 I also use Evernote as a writer's notebook these days, but I'm not loving that either. Thanks for this important post, Cathy! It got me thinking more about how I can preserve that all important writer's notebook. It's hard being stuck between worlds, isn't it? I often wonder what it must have been like to move from cave walls to tablets, from tablets to scrolls, from scrolls to print, through the years of the printing press and the many other transitions of print across our history. (My apologies for the oversimplification of history.) I'm sure this a dilemma I'll be playing with for some time. Thankfully, I have so many great people with me on this journey. Today, this is where I am. Tomorrow....we'll see. I was so excited to see all of your notebook thinking in one post...HERE! Splendid! You actually mentioned two pieces I find myself thinking about often. My drafts are often in Google docs. 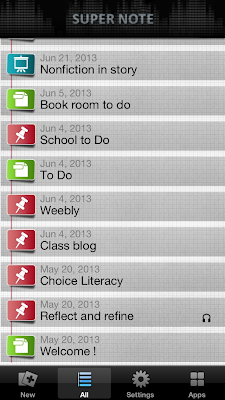 Yes, I should probably think long and hard about writing in the cloud...but, well, it's what I do. 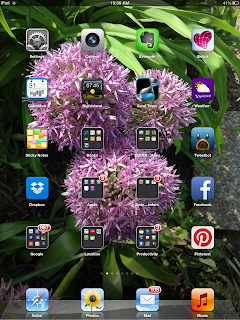 Secondly, you mentioned iPhoto for writing visual prompts. This came up a few times at our Choice Literacy Retreat. 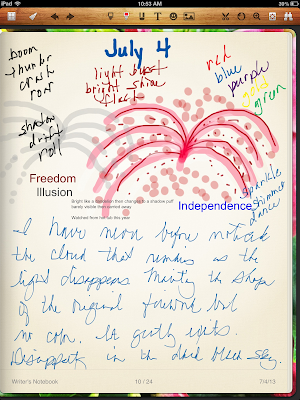 It's one of the reasons I like using Noteshelf as I can insert photos. However, I know it is something I do not do enough of when thinking about collecting ideas. Using images for writing ideas is something I need to think more about with my students as well. I have found using apps to be a bit like adding nutritional food to your diet, drinking enough water, making room for exercise, or getting enough sleep. It's changing habits which is never easy. For me, it became necessary when what I was doing was no longer working. It's a process --- and I still have a lot to learn. 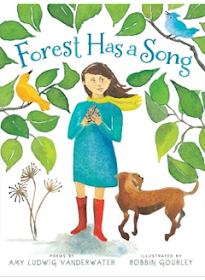 Of course, it is also why I like stopping by Amy's blog - always a chance to peek into someone's process. 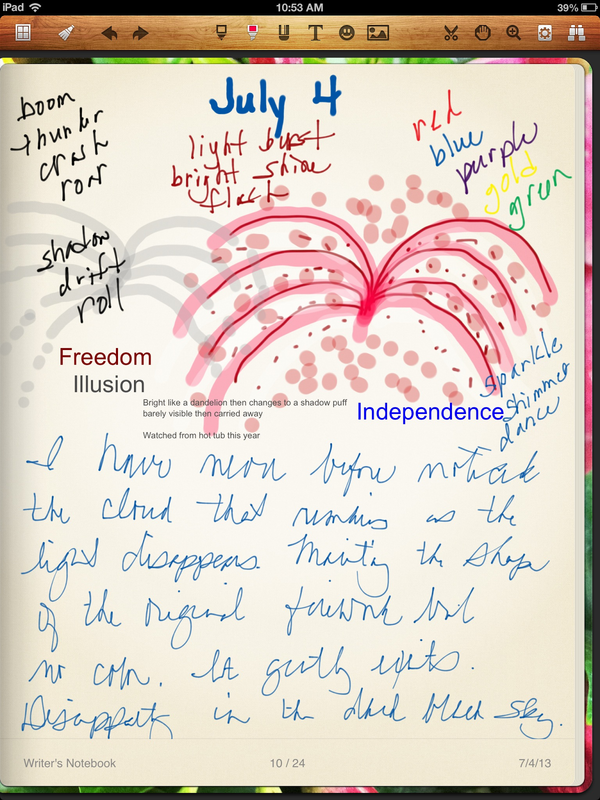 I've been working to learn more about Evernote-have used the notebooks on Penultimate, & have played with the app Notability. I still use writers notebooks, different for different uses actually since I do different kinds of lessons with teachers. I actually write quite a bit on a word document, then if I want to save & share, move to Google Docs. Just as you, and Jennifer said, it's messy, but it's also great to have such choices now! Thanks also for the Supernote idea. I don't know that app & will try it! Great post Cathy! I have always enjoyed a peek into your notebooks. I admire people who can so easily maintain a notebook. I envy those who have collected notebooks and stories across the many chapters of their lives. 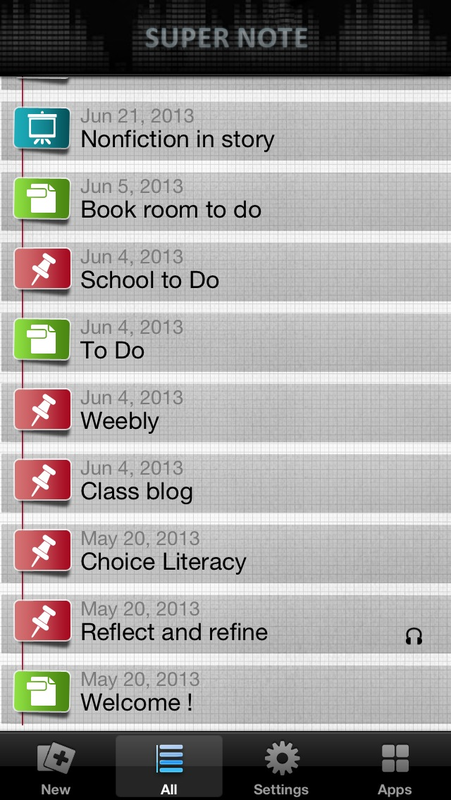 I think Evernote has a lot of potential for collecting ideas as a writer. It seems to me it would be especially useful when collecting information for research. I haven't used EN for that, but it seems like it would be perfect. Interesting. 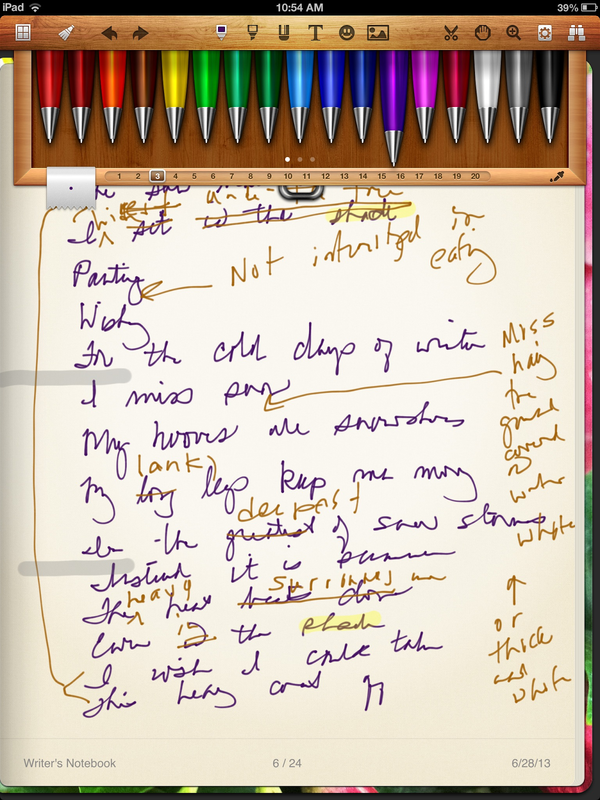 I'm in the tech field, but still prefer paper for writing/journaling. No batteries, file formats, changing apps/technology/formats, or distractions. For scrapbooks, I make either basic digital scrapbooks or paper Smashbooks.